Heat sufficient water in pan. Once it boils, add spinach leaves, and boil for 1 minute. Remove from the hot water and put into chilled water. After 2 to 3 minutes, squeeze spinach leaves and remove excess water from it. Blend spinach leaves in smooth paste. Keep aside. Heat 1 Tablespoon oil in pan, add cumin seeds, garlic, green chilly, sauté till garlic brown. Add spinach paste, salt, garam masala, mix well. Cook for 2 to 3 minutes or mixture become semi dry. Add lemon juice, mix well. keep aside. Heat non stick tawa. Pour 1 to 2 Tablespoon Uttapam batter on it. Don’t spread it. Pour some oil and Cook till evenly done from the underside. Similarly make the remaining uttapam. Take serving plate. Arrange baby uttapam. 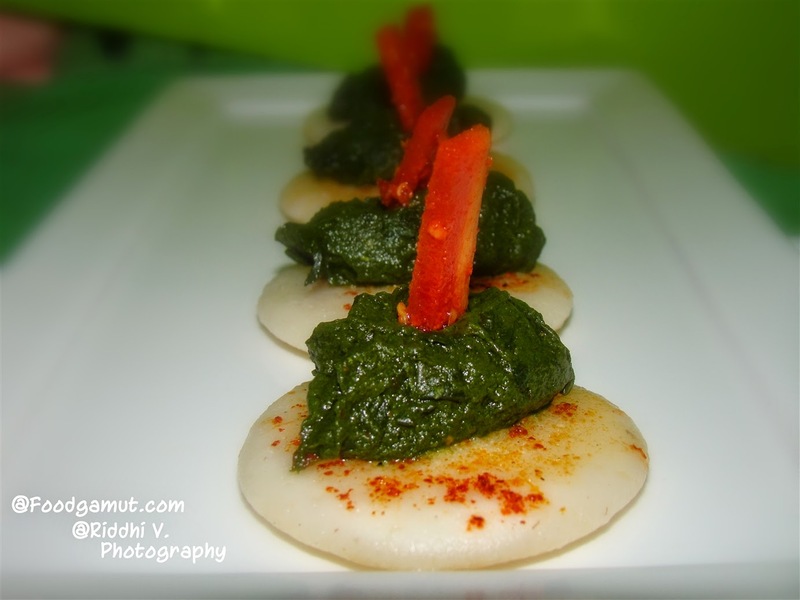 Arrange 1 tablespoon spinach topping over uttapam. Garnish with carrot pickles.